Chondona or Chandana (macaranga peltata, family: euphorbiaceae) is an evergreen tree with profuse branches and nice crown. The tree usually gets 12 m height. Young parts of the tree are hairy but smooth. Its leaves are very spectacular. 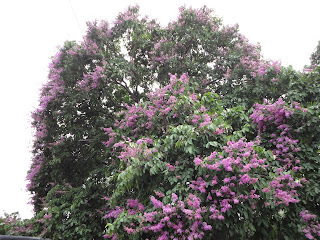 In Bangladesh the plant is planted on the roadside areas and parks and gardens for this reason. Leaves are big, dark green, broadly ovate to orbicular, apex pointed, extended slightly, 15-20 cm long and 12-18 cm wide, alternate, smooth upside, glandular beneath. Veins and midribs are palmately arranged on blade. Petiole is very long and it is strangely connected to the lower part of the blade. Flowers are small, creamy white on raceme inflorescence. Male flowers (in the pic) grow from the axil of large bracts. Fruit is capsule, round, orange-red. Propagation of the plant is caused by seeds. Flowers appear in March-April and fruit in December-January. By the by, the species name 'peltata' comes from its shield-like leaves.